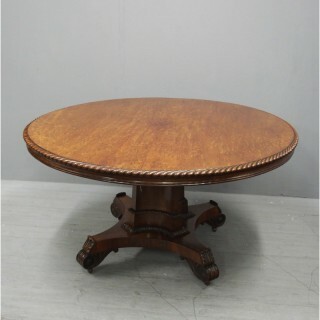 Circa 1820, exhibition quality Scottish William IV tilt top circular breakfast table, possibly by Mein of Kelso. The top has a carved gadroon edge in plum pudding mahogany and is supported on an unusual tapering, concave, two-part pillar with acanthus carved collar. This is over a shaped quadripartite plinth base with acanthus carved feet, with hidden brass and porcelain castors.